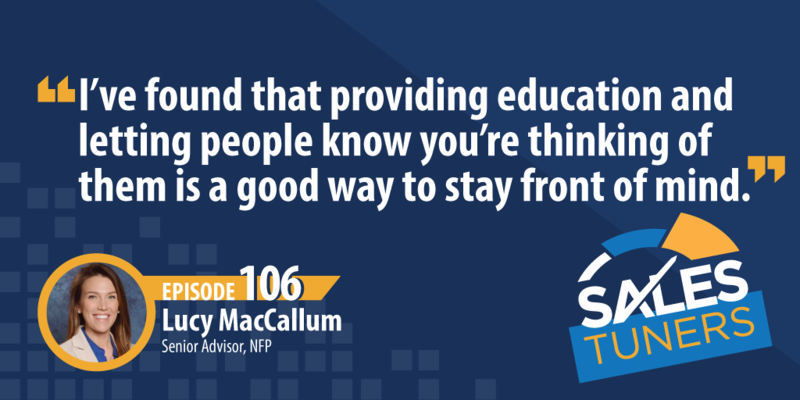 Lucy MacCallum (@LucyMacCallum) is the Senior Advisor at NFP, a leading insurance and employee benefits broker. A former lacrosse player at UMass, Lucy has spent the last 10 years winning every possible sales award in her industry, reviewing more than $250M in the pipeline during that time. Lucy’s interest in sales was sparked when she worked for Red Bull. During this experience, she built confidence approaching different groups of people and realized she had a knack for making them feel comfortable. From there, she landed a job with ING (now Voya Financial), went through their intensive sales training program, and eventually moved on to the insurance industry. Initially, she had no desire to get into insurance (most people don’t) but has since fallen in love. She found many of her prospects already had their bases covered by other providers. So, Lucy learned to overcome this by uncovering any pain points then gently stirring them up. It may not provide instant success, but with pleasant persistence, she has achieved impressive results. Act as a Resource: With more information than ever readily available for prospects, we need to become good stewards of context. What are your prospects likely not thinking about? What are the real challenges they should be worried about? Figure out how to get ahead of their search patterns and provide them real-time resources. This could be upcoming changes in the industry, it could be potential competitive information, or it could just be research you’ve done into the problems facing people in similar roles. Have a Bias Toward Action: From the timing to resources, or even fear, there will always be reasons you can use to talk yourself out of doing something. Nike may have been the first to say it, but I’m here to repeat it, “just do it.” There is nothing wrong with being prepared, but when it starts to hold you back from advancement, that’s when I have an issue. I’ve read a lot about Jeff Bezos “regret minimization theory” where he talks about the concept of looking forward 10 years and thinking about which decision he will regret if he fails to act and then choosing that path. Read: Yep, simple I know. You’ve heard me offer free books from Audible. You’ve heard me offer free book summaries from ReadItFor.me. But something Lucy said in our conversation really stood out to me. She said reading helped her get her speech down better as well as have topics to open conversations with people. I had honestly never thought about it that way. I already read a ton, but I’m going to start being intentional about capturing the ideas of the books I read and find ways to share them naturally with prospects and clients.